When the sun decides to shine every so often in winter, we can’t think of a better way to spend the afternoon than soaking up some vitamin D outdoors with a great book in hand. Your green oasis is waiting for you, but before bidding farewell to cosy interiors, consider the possibility of creating a patio reading nook. It’s both an extension of all the comforts of home, and a gateway to enjoying the great outdoors all year round. So why not embrace your inner bookworm and pull together a picture-perfect alfresco reading setting of your very own inspired by these tranquil reading nooks. An inspiring outdoor space at home is a true blessing, and it pays to consider setting up different activity zones on your deck area other than alfresco dining. A patio can be turned into a reading retreat that can compete with any room in terms of usability and comfort. Pair up a cushy couch with a coffee table, and you’ve got yourself a perfect spot for morning sipping and afternoon chilling. A cabinet to display plants, books and homey décor can also be a nice touch, and double as a buffet-style serving table during al fresco parties. Another option is to set up a lying area that you’ll never want to leave. It can come in the form of a porch swing daybed, or embrace the DIY approach and turn a trampoline into an outdoor hanging lounge. Add an abundance of plants in containers and pots to your setting, and let the lines with nature blur. Just don’t overlook an all-weather side table, a simple, inexpensive addition that improves the functionality of the space and makes it more inviting. If you’re stuck for ideas, start out with ways to enhance your basic outdoor furniture with cosy and comfy accents. Introduce some typically indoor elements like warm throws and cushy pillows to soften your outdoor space. Pay attention to colours because the decorative pieces you add are ideal for personalising your special reading space. Finally, anchor the dining or coffee table by laying a nice patterned rug. Define the zone further by hanging a dramatic chandelier or boho lantern over head. If you want to set up an innovative sanctuary, that is off limits to bugs and the mood swings of the weather, check out a stunning garden igloo. This transparent canopy forms a geodesic dome shelter, allowing you to soak up the garden scenery around you minus the wind chill and rain. The minimalist design enables people to get creative with decoration, and the versatility permits use all year round. Some people like bold furniture additions to be multi-purpose.If you’re seeking to acquire both an outdoor sleeping area, reading spot and a place to hang out with friends opt for a hanging seat or bed. If hanging isn’t your style, there are a lot of fantastic fixed outdoor day bed options. Splash out on a king sized day bed topped off with plush cushions for the ultimate in luxury outdoor reading experiences. Others just crave for a secluded corner for peace and quiet. If you don’t have a lot of outdoor furniture to begin with, that’s no problem. You can simply put a deck chair under a tree and utilise it not only for shade and shelter, but also to hang some art and lighting, think lanterns or fairy lights. An old tree stump could even serve well as an impromptu side table. Finally, surround yourself with aesthetically appealing garden decor such as an artsy sculpture, pot plants or a soothing water feature for added visual appeal and tranquility. 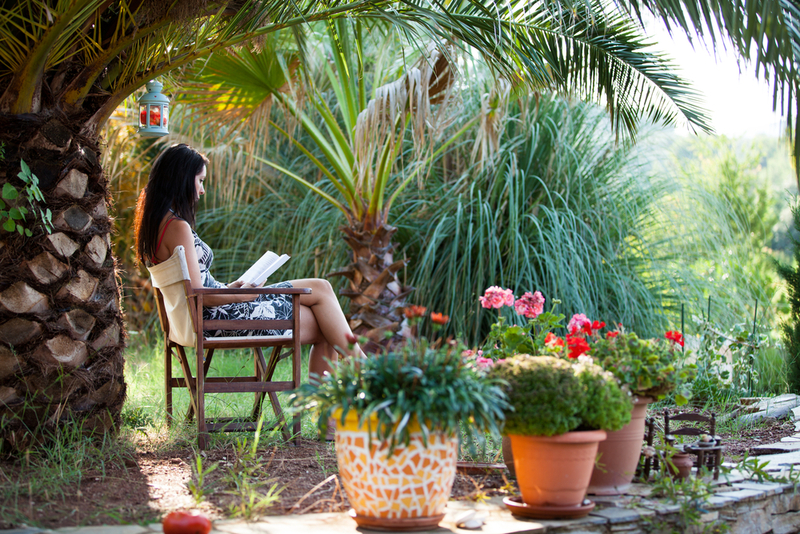 There’s nothing like a secret garden reading spot. Position it near bushes or some other green screen like hedging that blends the nook into its soothing garden landscape. My favourite plant choices to have near by are lavender and rosemary, as they bring rejuvenating fresh scents to the surrounds. Try to find a distressed antique bench, and opt for romantic, vintage fabric cushions. Take advantage of the illuminating allure that candles and a fire pit offers, and you’ll have yourself an enchanting nook fit for devouring romantic novels. A ‘she shed’ or ‘man cave’ is a great way to treat yourself to a striking garden reading hideaway. With a sleeping loft, kitchenette, and other features available, it can also serve as a little guesthouse. Adding an outdoor bar will make it even more party-friendly, but if you’re keen on spending some time alone with only the cool breeze and a novel keeping you company, think in terms of hammock chairs, day beds and bean bags. If you plan on making your outdoor reading area a permanent fixture of your yard, consider adding attractive paving as a feature and weather resistant furniture. Take a look at these decorative concrete options made of natural materials and comfortable outdoor furniture items and furniture covers to keep your outdoor reading nook looking good for years to come. Behold, your outdoor area or garden has become a place where you can spend some serious ‘me time’ and relax with a good book or two. All you need to create a peaceful outdoor reading nook is a comfy place to sit or lie, as well as a level spot to rest your coffee and book. Liven up your nook with some splashes of colour and soft furnishings to compliment Mother Nature’s best work. Don’t miss your chance to bring the indoors out, forget the household chores, and melt your stress away in the fresh air by setting up your very own comfy reading nook. Derek Lotts is a regular blogger at Smooth Decorator. Smooth Decorator and its team of dedicated home improvement specialists and enthusiasts will inspire you with advice on decorating every corner of your home and how to strike the perfect balance between practical and comfortable.